Your favorite marsupial, Crash BandicootTM, is back! He’s enhanced, entranced & ready-to-dance with the N. Sane Trilogy game collection. Now you can experience Crash Bandicoot like never before in Fur-K. Spin, jump, wump and repeat as you take on the epic challenges and adventures through the three games that started it all, Crash BandicootTM, Crash BandicootTM 2: Cortex Strikes Back and Crash BandicootTM: Warped. Relive all your favorite Crash moments in their fully-remastered HD graphical glory and get ready to put some UMPH in your WUMP! Dr. Neo Cortex has a plan to take over the world, and he wants to create genetically engineered animals to do his bidding. To create his minions, Cortex kidnaps as many animals as he can; Crash Bandicoot’s girlfriend just happens to be one of his victims. 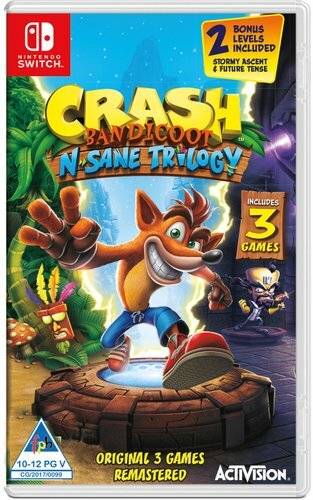 Take control of Crash as he runs, jumps, and spins through 30 levels of intense action on three different Australian islands. Only you can help Crash save the animals, save his girlfriend, and foil Dr. Cortex’s plot. The evil Dr. Neo Cortex is back...out this time to save the world? And he’s asking for help from his arch nemesis, Crash Bandicoot? Is this just a conniving plan to lure Crash into Cortex’s next dastardly experiment? Can Crash win again or will he join Cortex’s mindless zoo? Bigger free-roaming 3-D environments, all-new animations and a whole host of colorful characters – watch as our hero Crash, ice-skates, rodeo-rides a polar bear and jet-packs through zero-gravity in the continuing adventures of Crash Bandicoot 2: Cortex Strikes Back – This time he ain’t joking! Oh yeah...he’s back...AND he’s ready! It’s a Whole New Time-Traveling Adventure! All new-style gameplay action – scuba dive, ride a motorcycle, a baby T-Rex, and go free-roaming airborne in a plane! Play as Coco! Gallop along the Great Wall of China on a tiger, go extreme on a jet-ski and other high-flying surprises! Prove your skills with the new Super-charge Body Slam, Super Slide, Double Jump, Death-Tornado Spin and a Laser-Guided Bazooka. All new enemies include a new Big Boss, Uka Uka, N. Tropy, a menacing Dingodile and of course, the return of some favorites like N. Gin and Tiny. More Action. More Fun. More Puzzles and Secret Levels. And you didn’t think it could get any better!